We have installed SQL Server Management Studio successfully on our local machine. How can we connect to Default SQL Server Instance or Named SQL Server Instance from SQL Server Management Studio( SSMS)? Open SSMS and then type (local), if there would be local SQL Server Instance on your machine, it will connect to it. You can simply put Dot (.) and connect to your default SQL Server Instance as shown below. You can use loop back IP to connect to your Default SQL Server Instance Name. 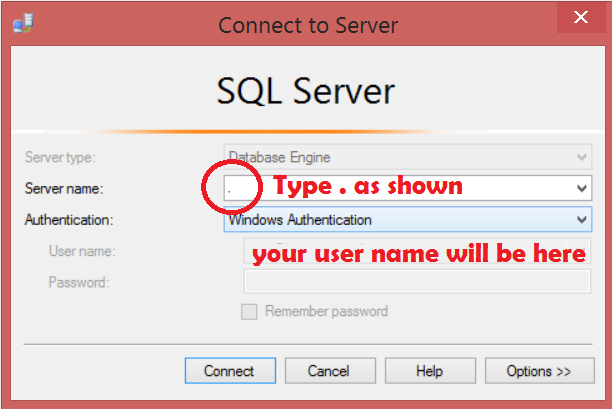 To connect to Named SQL Server Instance from SSMS, you have to provide Machine Name\SQL Server Instance Name. Let's say if your computer Name is AamirPC and you have Installed Named SQL Server Instance "SQLServer2016". To connect to SQL Server Instance , you will be typing AamirPC\SQLServer2016.